« Dude, where’s my gallbladder? “oc, why did you take out my gallbladder?” I asked upon seeing him for my follow-up consult. “It was in the way (of the liver).” He replied jokingly. What a guy! I love him and his sense of humor. 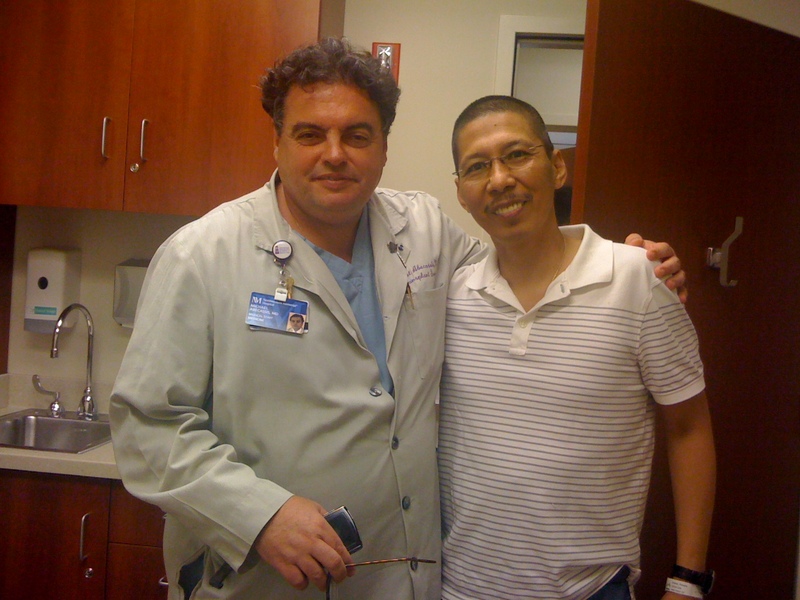 This was my second follow-up visit after my liver resection last April 20, and maybe this last time I will see him. No offense to him but I only have one liver left now. “You look good and fully recovered. Let me see your scars.” I raise up my shirt to show him my wound. “I would have looked better if you had worked on my abs too.” I said and he laughed. He points to his belly and said. He said that my scars were healing well, except for one portion. Pretty soon it will just fade, he adds (like memory). He instructed nurse Lori to touch up the non-healing wound, then bids me good luck before seeing other patients. And, just like that, we both move on. I was happy to see Dr. A and Lori, but sad as well because I know I may not see them again. Everyday, cases like mine come and go in their offices. Perhaps some of them worst than mine. While in the waiting room, I saw a patient with a bag full of medication–a transplant patient. You see Gods work in their offices. I am only one of the people passing through their office/clinic, and I am a grateful beneficiary of their outstanding medical skills and kindness. He may not remember me when I see him me in the streets of Chicago but I will definitely remember him, and those who have helped me along the way. Thanks, Dr. A and Lori. PS: Recovery week is here and I am slowly getting my strength back. Woohoo. I love that you took pictures with your surgeon and his nurse. Great idea. I was one of many for my surgeon too, but she had the dubious distinction of being the first to inform me that I HAD breast cancer (after she removed it! ), something that remains permanently ingrained in my brain. Of course I remember her for more than only those words—she was very compassionate and listened to my concerns as if she’d never heard them from (probably) every other patient and really supported me through a series of surgeries together. My oncologist—she can’t get rid of me! I don’t plan on letting her off that easy. Keep up the recovery and I look forward to seeing you in yoga soon! Hi Lisa. Well, we have our surgery scars to remind us of them. You might say they touched us in a different way. We can always tatoo their names beside the scars. Scars tell us where we have been, not where we are going! I went to Monday night yoga — you know, tough — I thought of you. Wished you were there. I hope you are mending well. I wanted to tell you that I have taken several calls as a peer counselor on the BC Network of Strength, and let me tell you, it is incredible. First listening to calls and hearing the peer counselors help the callers. Then I got my chance — I thought I would be scared, but funny thing is that I was 100% alive and with the caller, understanding where they were at in their journey. My supervisor and ‘shadower’ told me that I was a natural and had a great rapport with the callers (all 2 – they were, to me ‘easy’). I asked for another oppportuntiy to work with the same counselor so we are on for 24th, then I will (hopefully) get my ‘wings’ and fly! Looking v forward to your posts and seeing you in yoga!! Hi, Debbie. Thanks for the note of encouragement. Everything will be fine. I am looking forward to the day we see other again. Bo.